I'm going to post my own match this time because no one is likely to get it. I was thumbing through some Stack's Bowers literature in today's mail and spotted something familiar. 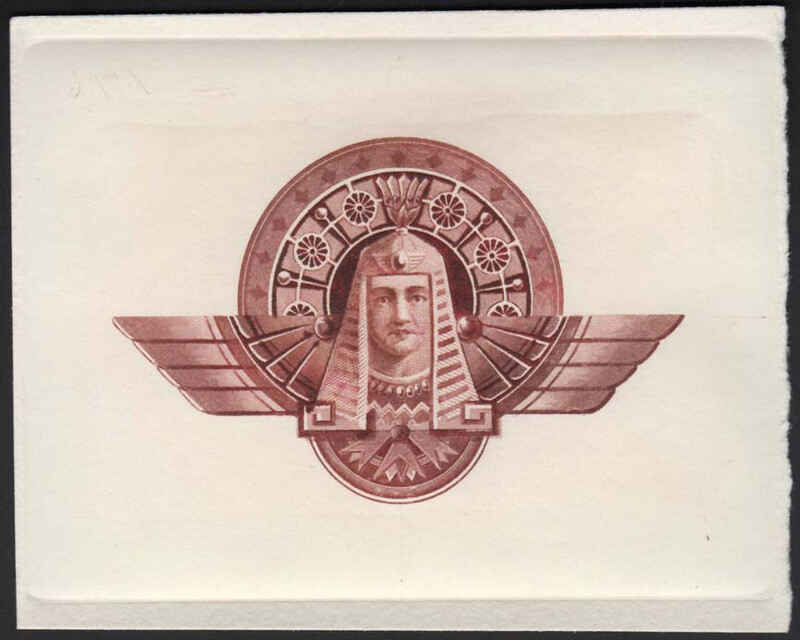 I have a little Egyptian intaglio vignette printed by a friend for me from an original die. Neat and very unusual design. 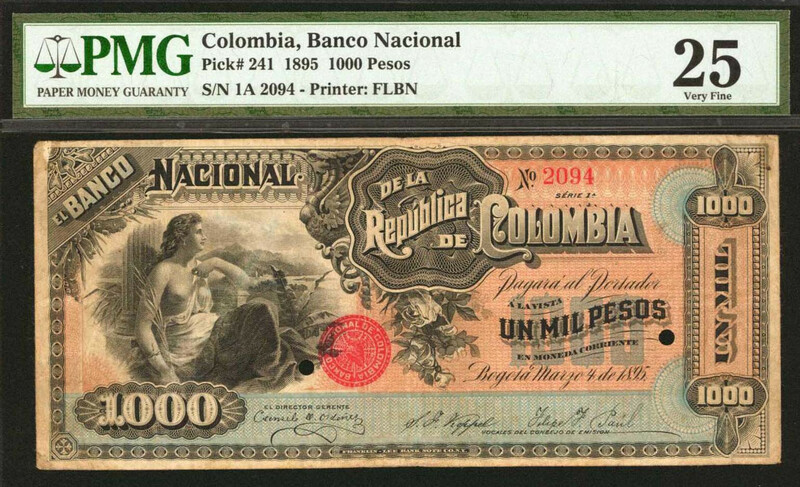 Turns out that it's an exact match to the back of an 1895 1000 peso Columbian specimen note produced by Franklin-Lee BNC. 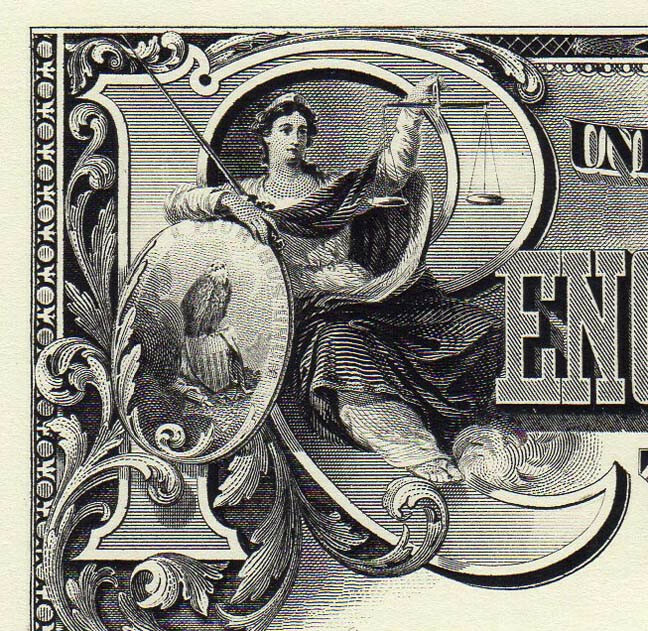 Seems an odd design choice for a banknote from Columbia -- I'm not sure this one was ever issued. 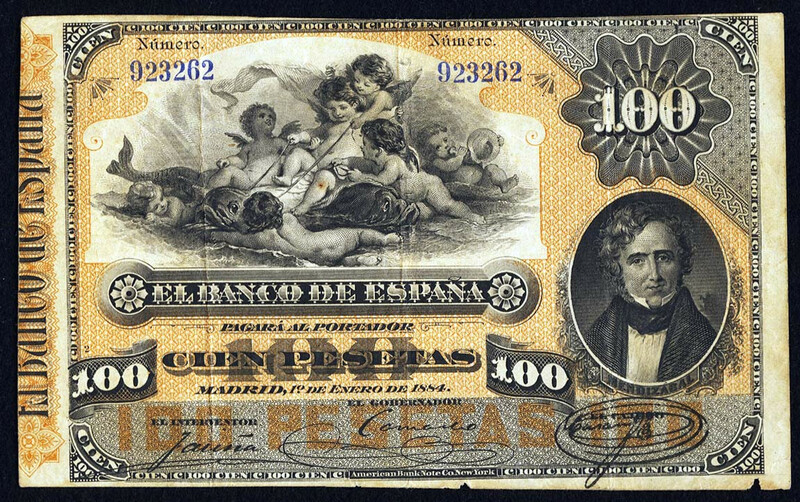 And nobody matched the Galatea vignette -- it appears on an 1884 Spanish 100 peseta note. Very nice - but one must have a museum quality global collections to meet some of these challenges!!! 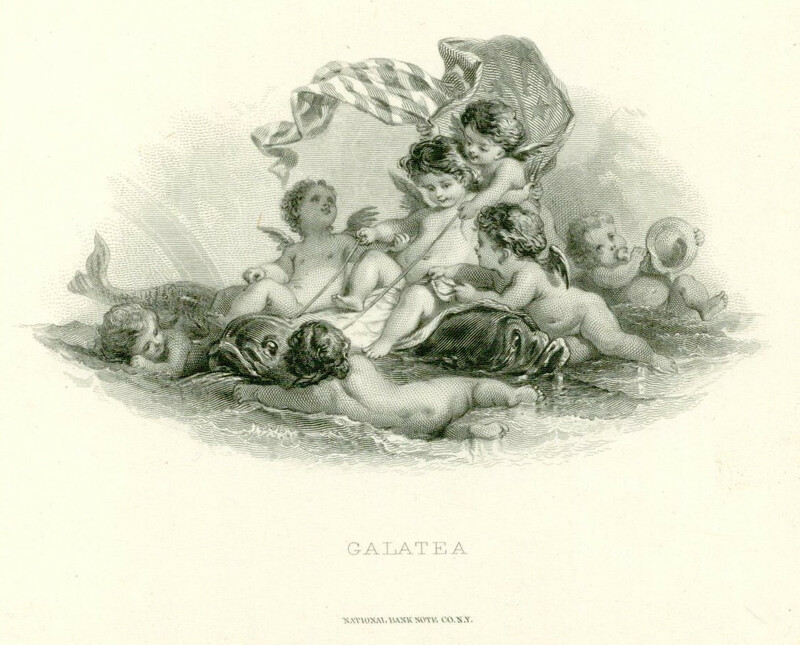 is the flag in Galatea meant to be the star spangled banner? and then clipped off for a spanish note? Here's one I came across during some recent scanning. I know of a match, but there are some differences. Tough one. I’m out. Berny, Youngcollector ? 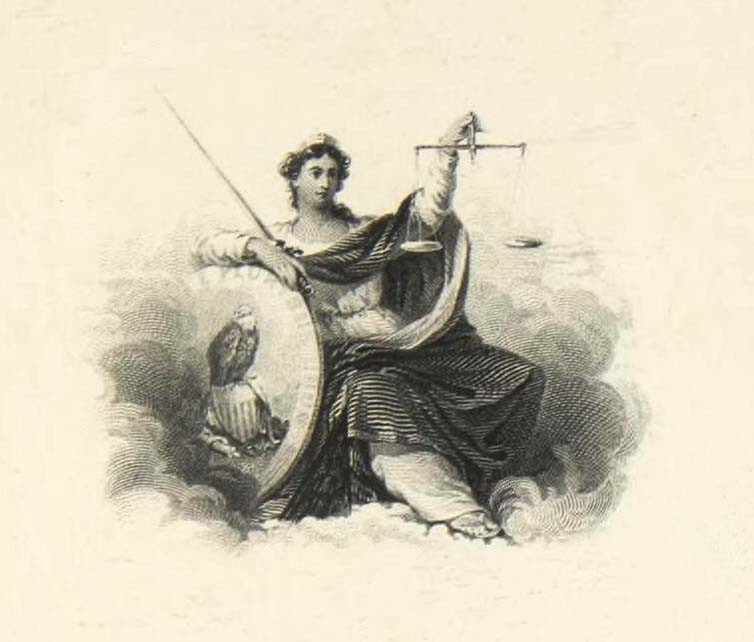 It's a BEP engraving, if that helps. YoungCollector ..nice job. Reverse of $10 NBN. Correct! But look closely and tell me what's different. I'll toss a new one out there -- this is one of Youngcollector's favorites. 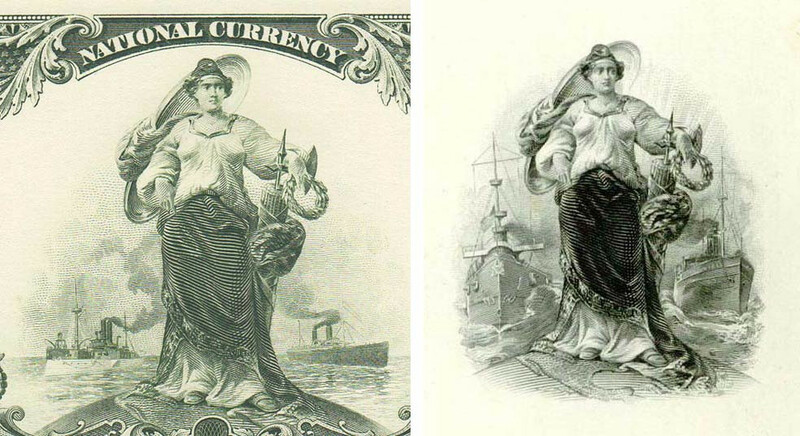 It shouldn't be too hard to find her on federal currency. 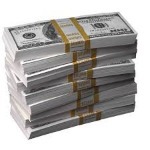 But I have another challenge -- find a usage on something that did not circulate as paper money in the U.S. I know of several examples including one I just discovered today. Those are fantastic notes, Bernie! Great match-ups. Well here's the non-currency match that I alluded to earlier. 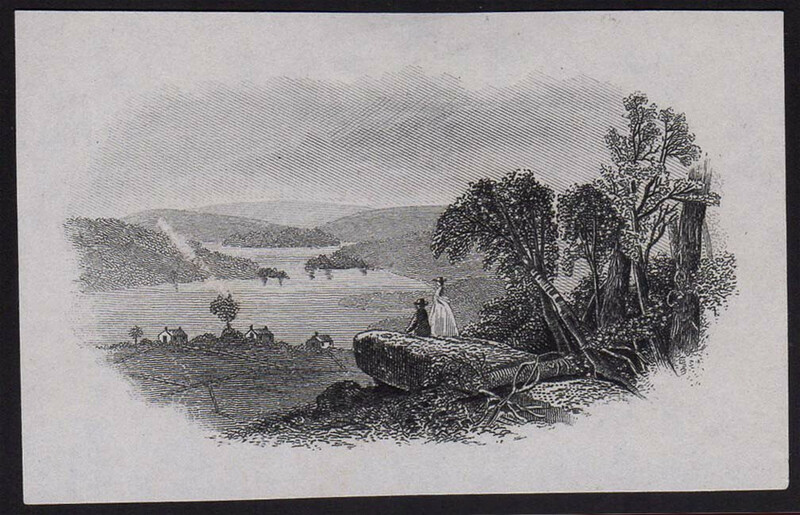 I found it on, you'll never guess, a souvenir card (B-217). 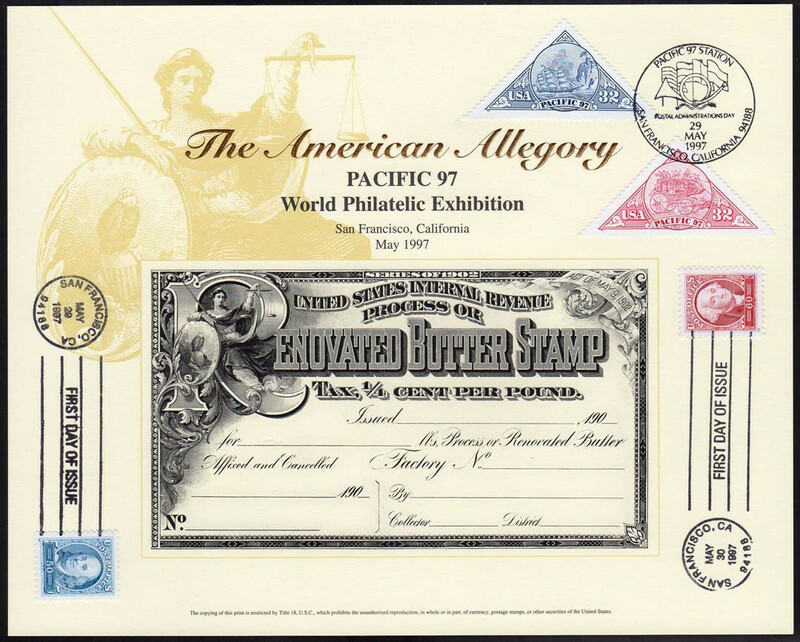 This is a reprint of a rare taxpaid revenue for renovated butter -- you'll have to read the description to understand that (thankfully it's no longer legal). I think this might be one card Youngcollector will want to pick up! 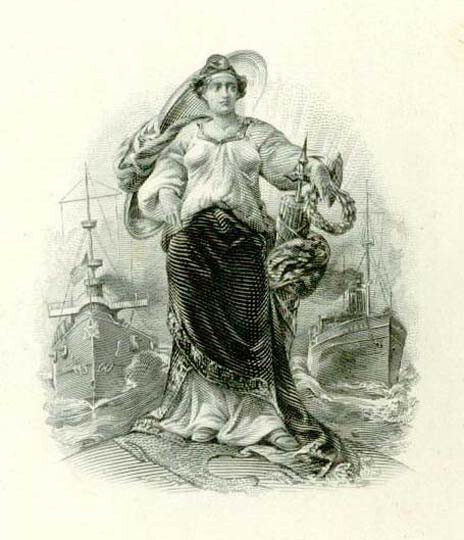 Good eyes -- yes, the ships are different. 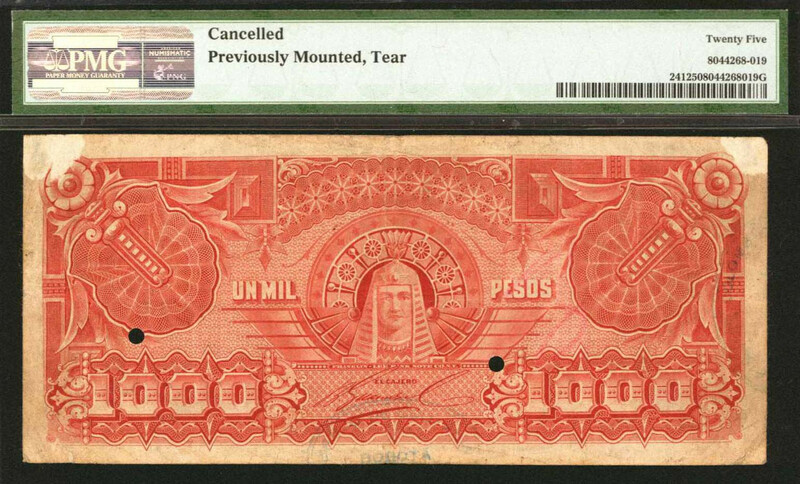 So either this was an early proof that was altered before being used on the national note, or it was adapted later for another use. I haven't dusted off this thread for a while, so here's one that I call the "Tiny Landscape." 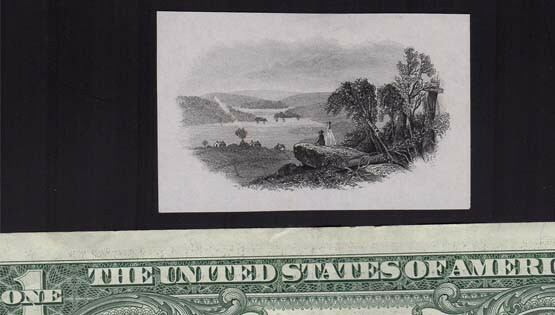 I made a scan next to a dollar bill for scale -- it's only a couple inches wide, but lots of detail. 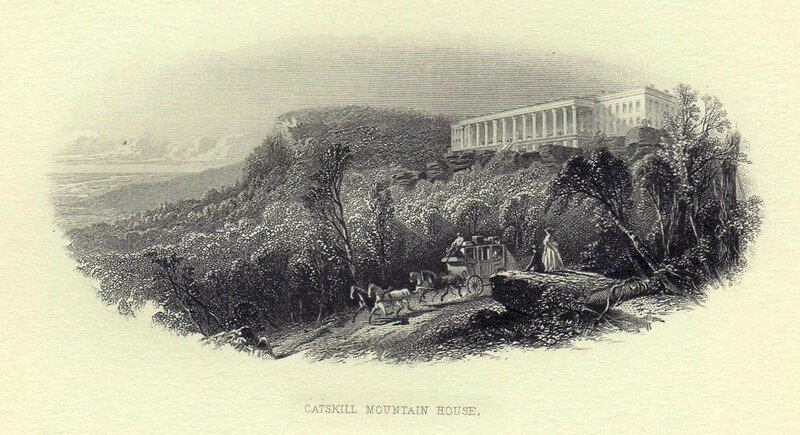 What I recently noticed is that the right side of the engraving, with the people on the rock, also shows up on another banknote engraving of the Catskill Mountain House, a well known landmark for more than a century. Which was engraved first, I'm not sure. 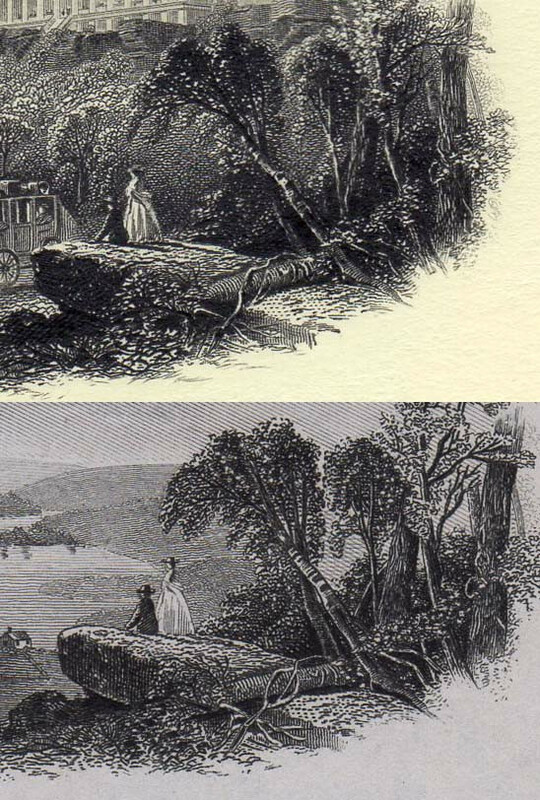 I initially thought part of one engraving was simply transferred to the other, but a close comparison shows a number of subtle differences. So they may be separate engravings despite being the same size. Has anyone see either of these on any obsolete notes? This is one instance where I don't know of a match yet. wow, you have an eagle eye! 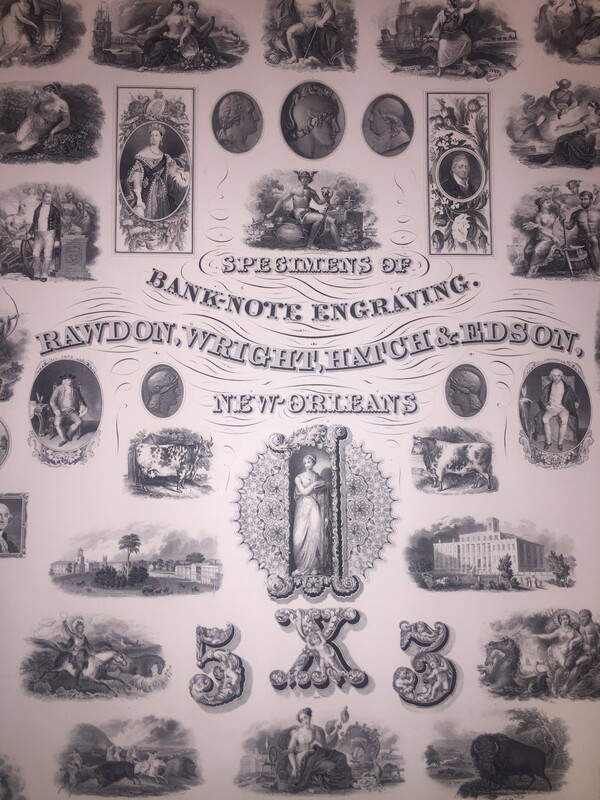 This advertising note is attributed as RAW-145 in "The Catalog of Printers' Test Notes" Originals sell for $1,250, but be aware there were 998 numbered reprints ordered by the Pennell Publishing Company in 1979 for SPMC on the market. These sell for about $600. ...there were 998 numbered reprints ordered by the Pennell Publishing Company in 1979 for SPMC on the market. These sell for about $600. You can usually find them for less than $200, actually. This is listed in the SCCS catalog as FSO-1979A, but I think it might be more appropriately listed as an banknote advertisement reprint.